How can I make this item more useful? How can I make it more accessible? How can it fit better? Do I even need it? These thoughts entered my head about once a day while on trail. Not that I’m complaining – I love thinking about how to become more efficient with my gear set. You can see my starting gear list here. I’ll eventually update the spreadsheet version of this with notes on each item. This was extremely valuable on my Long Trail hike – write down what worked and what didn’t upon trip completion, then reference before the next hike. Wait, I thought this was about gear? Since gear is being carried most of the time on a thru hike, how it fits/sits/packs influences what you think of it. Plus I did say these were “ramblings” not organized thoughts with some sort of flow! First off, routine is important while packing in my opinion, for a couple of reasons. I’m sure many people are fine stuffing things in their pack randomly each day, but I can’t stand it. Routines generally increase in speed with repetition. As the hike went on, our wake up to hiking time decreased by several minutes. When packing is routine, you know where to expect each item and don’t have to look for it. The chance of losing something is lessened. Alarm goes off at 5:45 am and I grab my hiking shirt and pants, toss them in my sleeping bag or under my pad to warm up a bit, then doze off for a few more minutes. Unpack my puffy from my pillow, take off my sleep shirt/pants and put on the hiking shirt/pants. Pack the sleep clothes into the pillow and put on my puffy. Stuff my sleeping bag into it’s dry bag. Deflate, roll up, and fold my sleeping pad into a square shape. My pack is stored in the vestibule so I grab that and take everything out of it – this may seem weird, but I found it a lot easier (and just as fast) to pack everything into an empty pack each morning, rather than try and stuff things around where items settled overnight. Put the sleeping bag in dry bag into the bottom of the backpack. Vertically position my clothes/pillow dry bag in the pack off to one side. At this point nature usually calls, and while I’m out of the tent I grab our Ursacks. Take out snacks for the day, put in hip pocket. Pack Ursack into center of pack, vertically. Slide raincoat, rolled into burrito, in empty space in pack. Pack the misc items into the front compartment of the pack – poop kit, stakes, flip-flops, etc. Slide squared sleeping pad into front of main compartment of backpack – this worked way better than storing it rolled up and saved some space. Take down tent, put into stuff sack and compress into remaining open spot in backpack, also vertically. I experimented with stuffing it without the stuff sack, which just resulted in everything else in the pack getting grimy/wet. The stuff sack weights nothing and is CF anyways. Store tomorrow’s dinner in cook pot overnight. My pot fits ramen, couscous, etc pretty easily. This is wasted space otherwise. Use a different colored bottle cap for dirty water bottle/bladder, just so you always know what’s what. If you have a ZPacks Duplex and you haven’t tried rolling vs stuffing, you should! Saved me a surprising amount of space, made packing the bag easier. It’s pretty nominal extra effort. There’s not a great way to turn this into a paragraph, so I figured I’d leave it here in case it’s of use to any future PCT hikers. Here’s a chronological list of what I changed gear wise, during our hike. Note that we skipped most of the Sierra’s, stopped in San Francisco for a couple weeks before skipping up to South Lake Tahoe. Oddly enough, after a few months, I found myself wanting an extension cord every time we were in town. It’s not ultralight, a bit bulky, and I never ended up actually carrying one though. It would have been nice for situations with limited plugs, or space near plugs. i.e Using that random outlet behind a store front that doesn’t quite fit your USB adapter. Or when the cheap hotel has beds blocking the plugs, etc. How did everything hold up? Sleeping pad was the only critical failure – I punctured a hole in it after about ~1400 miles of use. Easy field repair with patch that came with it, lasted the rest of the trip with no leaks. “The Big 3” are all well worn, but have plenty of life left for another long distance hike. As long as I’m not tempted too much by new fabrics or designs, I expect to reuse most all of this gear for the next long distance hike. When we started the stretch from Echo Lake to Truckee I had no idea what to expect for wildlife. This is the stretch where you can drop the bear canister, but that does not mean you’re out of bear territory. At 7,000-9,000 ft there was a chance of seeing pika and marmot who are right at home in alpine environments. And wouldn’t you know, in our first couple hours on trail we spotted a marmot in a patch of snow. Yellow-bellied marmots (Marmota flaviventris) are members of the squirrel family and one of the largest. They live in colonies at high elevation and dig elaborate burrows. Marmots spend over half of their lives in hibernation and have developed some pretty cool adaptions to survive. Their body temperature can go down to 41 degrees F, their heart rate decreases to 30 beats/minute and they only need to take a breath or two/minute. We did not see any pika, but I imagine there will be plenty when we make our way back to the High Sierras. Unfortunately we didn’t encounter much else in this 60 mile stretch other than this curious evening grosbeak (Coccothraustes vespertinus). This female bounced around camp for a while searching for food before tiring of me following her. Evening grosbeak have been observed eating 96 sunflower seeds in five minutes. The following night at camp we endured a rainstorm and some hail. Once the sky cleared we heard the territorial call of a great horned owl (Bubo virginianus). The most widely distributed common owl in North America, they have adapted to live in in various climates from desert to tundra. Hat Creek Rim and into Burney was full of birds. We took a break at Baum Lake where we spent our time cooling down and watching osprey (Pandion haliaetus) and white pelicans (Pelecanus erythrorhynchos) fishing about the lakes. 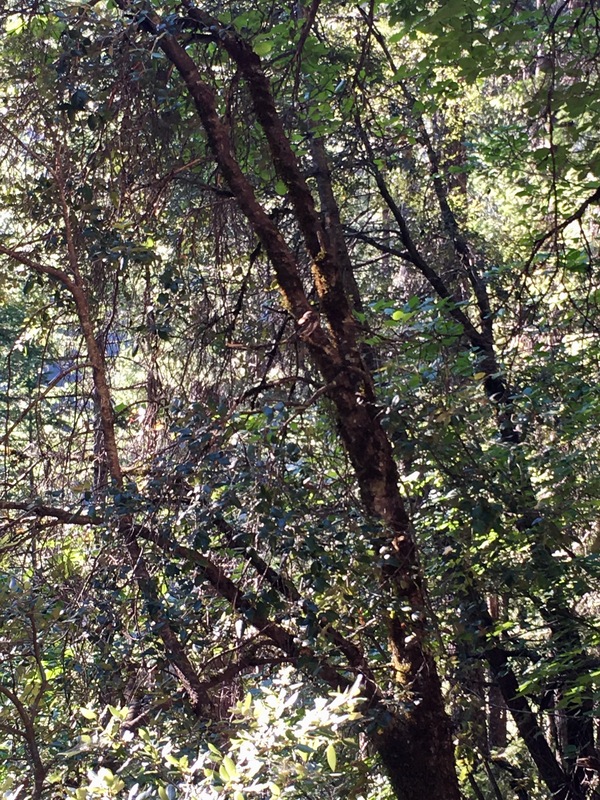 As we neared the junction for Burney Mountain Guest Ranch we scared off a barred owl (Strix varia) perched for its nightly hunt on the edge of the woods. 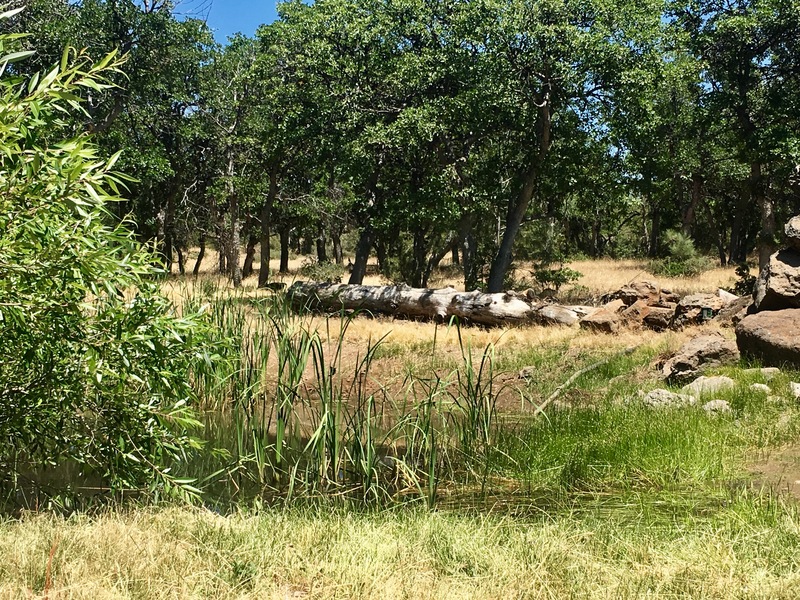 At Burney Mountain Guest Ranch we relaxed in the shade by this pond while we waited out the heat to hike. It might not look like much, but this pond was full of life. Dozens of species of dragonflies and damselflies darted back and fourth above the water after prey. Pairs of acorn woodpeckers patiently waited in branches above the pond for their opportunity to strike an insect. Beyond the pond a pair of California quail and their chicks scurried about the shade foraging for insects. Not an uncommon sight on the property as it used to be a quail farm. While I had better luck capturing photos of birds this stretch, they can’t all be close ups. So think of these next couple as an I spy type game…answers provided at the end! This American goldfinch repeatedly perched in the willows and then flew off. 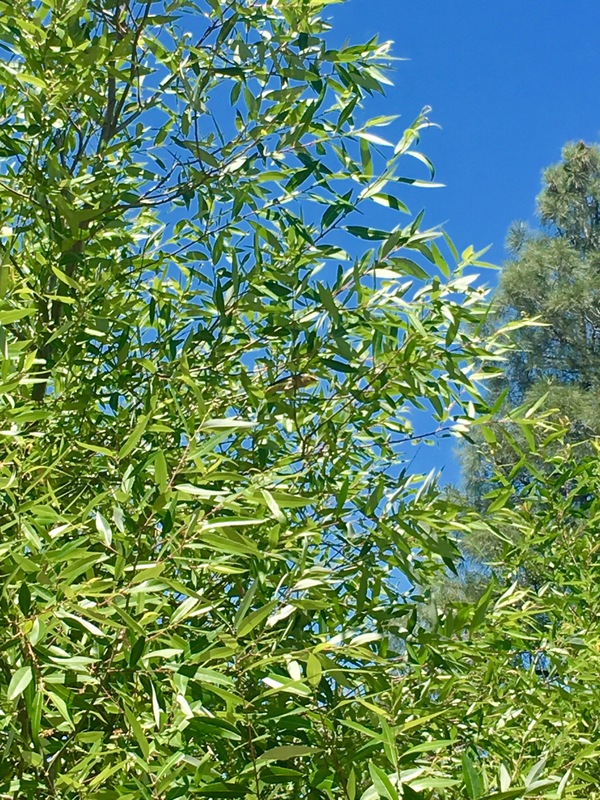 It may have been foraging for insects, however these songbirds primarily feed on seeds. 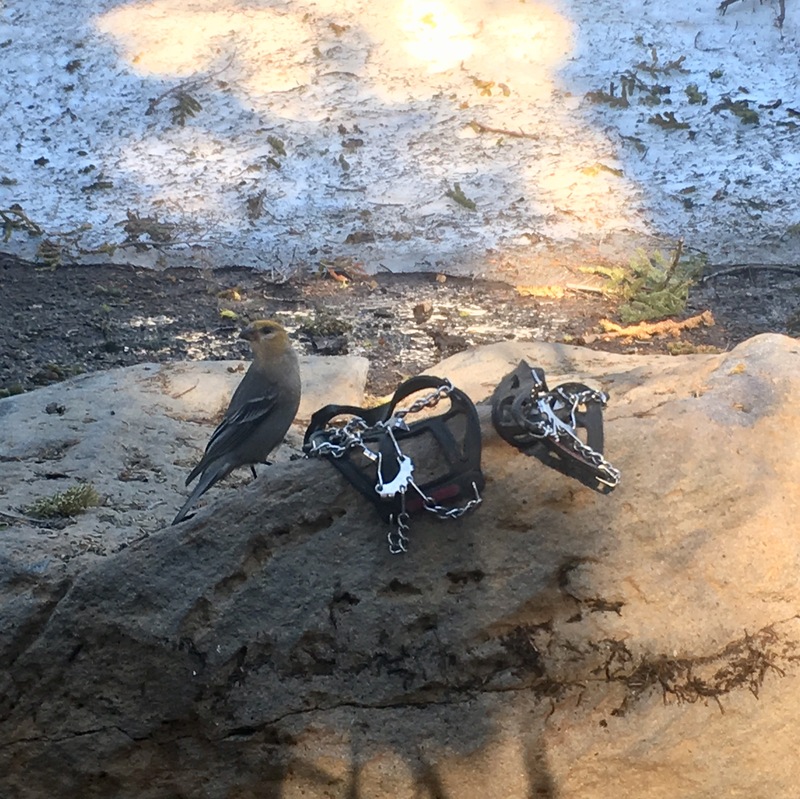 A few days later in the Shasta Trinity National Forest we stumbled upon one of the cutest and my personal favorite owls, a Northern saw-whet. These small owls are only 5-9 inches in height, but when threatened will elongate their body to appear like a branch. When prey is plentiful it is not uncommon for them to eat only the head. It may seem wasteful, but they also exercise food caching, meaning they will hunt prey and hide it in a safe place for winter. Though we didn’t see nearly as many reptiles as we did through Southern California, there were more of them than I anticipated. 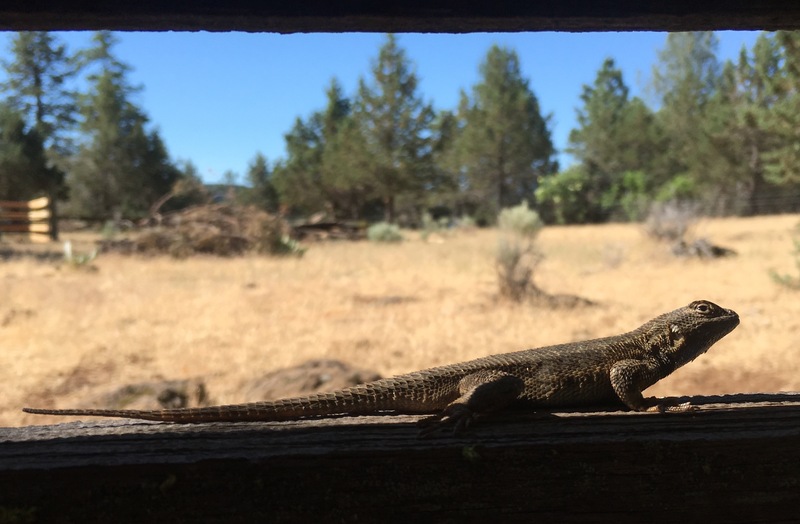 One very familiar species being the western fence lizard (Sceloporus occidentalis) and this one was actually on a fence! 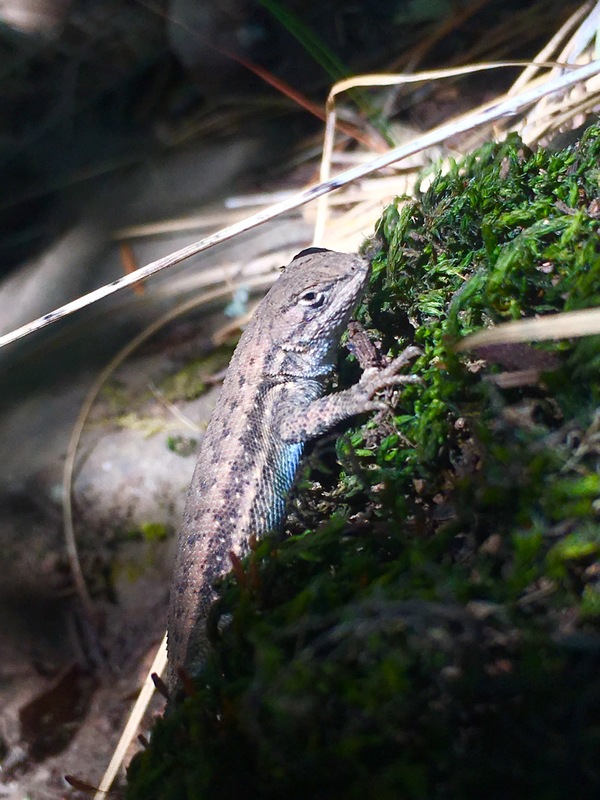 A relative of the western fence lizard, but slightly smaller, is the sagebrush lizard (Sceloporus graciosis). There are three different sub species of sagebrush lizard, western, northern and southern. My best guess is that this is the northern subspecies (Sceloporus graciosis graciosis). During mating season males of both species perform push-ups to display their bright blue patches and ward off other competing males. I wish I got a video that shows just how fascinating it is to watch two competing males run around in circles doing push ups. Locals kept telling us to keep an eye out for rattlesnakes in this northern section of California. It wasn’t until coming across this juvenile northern pacific rattlesnake (Crotalus oreganus oreganus) that we realized we really should heed these warnings. Surprisingly, this is the only rattlesnake we came across in this section, but it was not without alarm. While a juvenile rattler might not seem too frightening, at this age they have not shed enough layers for their rattler to be fully developed. Not to mention it takes juveniles some time to learn how to control their venom sacks. This means a bite could be dry or it could unload its entire venom sack. Based on my trekking pole experiment, a bite from this guy or gal might have been dry. Amphibians and insects were far more common in this stretch, something I’d attribute to seasonal changes more than location. The most common amphibian we came across was the western toad (Anaxyrus boreas), more specifically the boreal toad subspecies (Anaxyrus boreas boreas). This northern section of California is where the geographic range of the boreal toad and California toad (Anaxyrus boreas halophilus) overlap. These toads are easy to recognize from the light, sometimes yellow, dorsal strip running down their back. Males of these species don’t have well developed vocal sacs, giving them a call similar to that of a peeping chick. However unlike most frog and toad species, this call is less of a mating call for females than it is a territorial call for other males during mating season. One of the first frogs we came across was the Sierra chorus frog (Psuedacris sierra), also commonly referred to as Sierran treefrog. The latter name is not entirely accurate due to them primarily being ground dwellers. Although they mostly reside at ground level, their large, sticky toe pads do allow them to easily climb trees and cling to branches. Common throughout the United States and the largest frog in North America is the American bullfrog (Lithobates catesbeianus). While many might think of this as a native species, it’s historical range was actually east of the Rocky Mountains. Bullfrogs became common throughout much of California (with the exception of deserts and high elevation) during the 1920’s when they were being farmed for legs. ​American bullfrogs have voracious appetites, eating anything they can swallow such as crustaceans, fish, small birds/mammals and other frogs (including other bullfrogs). Sacs on the bullfrogs skin create toxins that make it unpalatable to many predators, making it one of the most successful invasive species in the west. There were a few nights we were lucky to camp by water and fall asleep to the sweet serenade of calling frogs. Although we didn’t get to camp at this small alpine lake it was bursting with frog life! Frogs are semi-aquatic in that they spend half of their time in water and half of their time on land. ​ Toads are also semi-aquatic, however after morphing into adults they are primarily land dwellers. 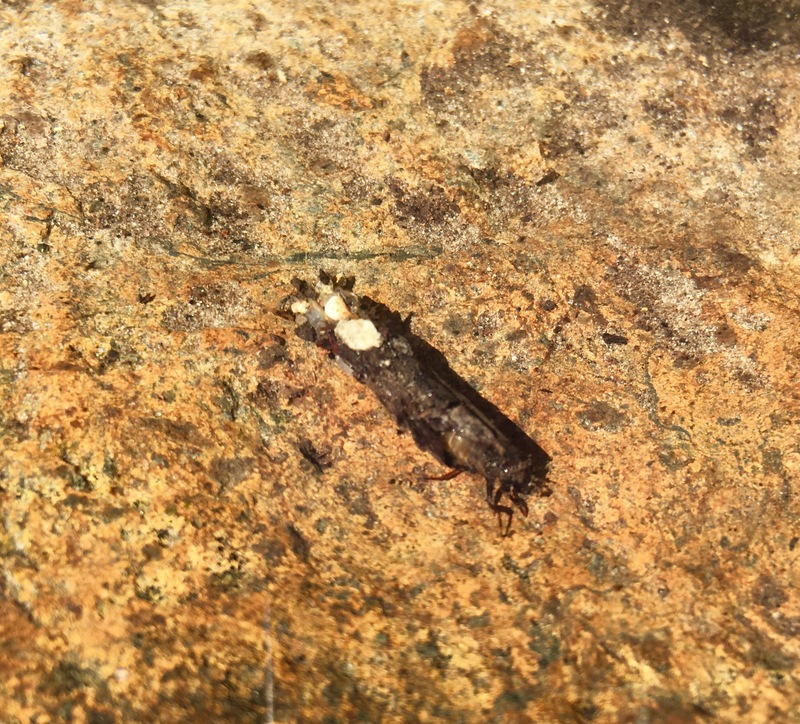 Similarly to frogs and toads, caddisflies larva are aquatic. Adult female caddisflies lay clusters of eggs on the underside of vegetation, just above the waters surface. Once the eggs hatch, they fall into the water where they live out their larval and pupal stages. This is a case building caddisfly in the order Trichoptera, they build cases out of rocks and/or twigs to protect their fleshy abdomen. Caddisflies are shredders/scrapers/collectors, meaning they feed on algae and plant debris found in the water. As a relative to moths, their final phase of complete metamorphosis involves attaching themselves to a submerged object and spinning themselves in silk. Once fully developed, they float to the top of the water where they molt and emerge as terrestrial adults. While we saw very few adult cicadas, we heard plenty and saw numerous casings. This casing likely belonged to a dog day cicada (Tibicin canicularis), a species of cicada that emerges every year mid-summer. 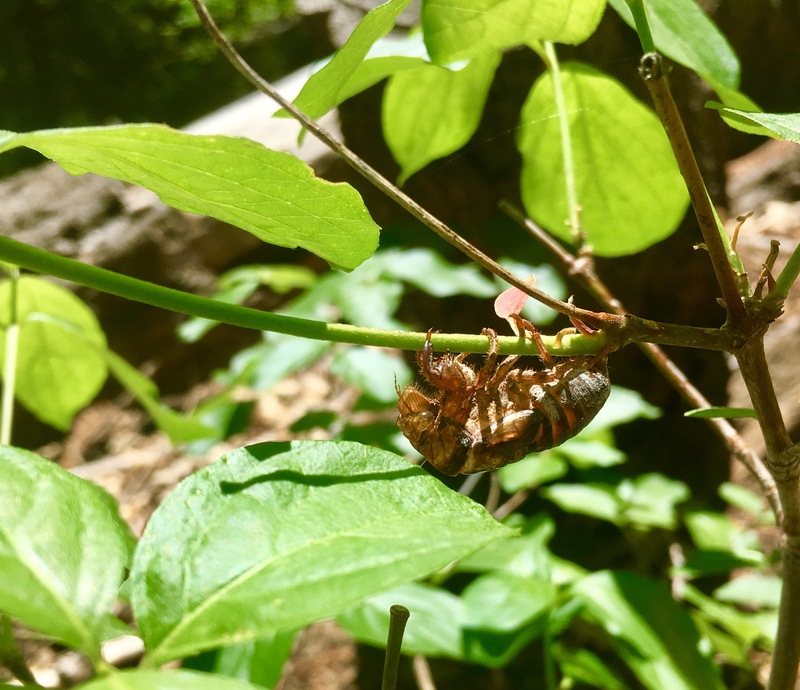 Adult cicada lay their eggs on the branches of trees. When the the nymphs hatch, they fall to the ground where they burrow under and feed on the juices of tree roots. Nymphs will spend 3 years underground before emerging to molt their exoskeleton. As adults cicadas do not feed, instead focus their energy purely on reproduction. While we ate lunch one afternoon this California sister butterfly (Adelpha bredowii californica) joined us to feast on some salt from our backpacks. Caterpillars of this species utilize oak trees as their host plant, particularly live oaks (Quercus agrifolia, wislizenii and chrysolepis). As adults they are attracted to dung, puddles, rotten fruit, sap, and some flowers including California buckeye, dogbane, and goldenrod. Many species of butterflies “puddle” or seek out moist substrate to extract nutrients and minerals. In most species it is just males that puddle, seeking out salts and minerals that get incorporated into their sperm. In the case of the California sister butterfly, both sexes puddle. Stay tuned for the much delayed flora and fauna of Oregon! After a lengthy discussion of logistics and many beers, we determined it was easiest to get from Bend to the Oregon coast, via our friends in Portland. The fire closures leave us missing trail and the smoky haze, scenery. It feels easier to hike a straight path, less segmented, another season. And for some reason, all we could rent car wise was a twelve person transit van. We had fun with it. Big thanks to the Streu&apos;s for picking us up in Portland and hosting us for several days! We took a nice trip to Wachella Falls, did a little bit of bouldering, and looked for views through the smoky haze covering the city and gorge. At this point we decided the most fun we could having finishing out the backpacking season was on the coast. So we headed to Astoria, close to Fort Stevens State Park, and spent a day doing touristy things and stocking up on some hiker foods. Fort George had some good beer – we&apos;ve been to several breweries in the past week and this stood out. Best food we had in town as well! And now we start southwards on the Oregon Coast Trail. Maybe we&apos;ll complete the it this summer, maybe not, but the contrast between the PCT thru hike and this is welcomed – clouds, cool weather, no fires or snow! For now we walk the beach, the cliffs, and explore the towns in between. 7/28/17 – Man, a real bed felt great. Slept for a solid 8 hours, then we got some breakfast. This place had some damn good omelettes and loaded hash browns! Our ride back to the trail wasn&apos;t available until 2pm, so we relaxed and chatted with some friends on the lakeshore. Got to the trail shortly after 2 and started hiking. After awhile we arrived at Thielsen Creek which was still mostly covered with snow. Found a hole in the snow, checked the area around to make sure the snow wouldn&apos;t collapse, dipped my water bladder in …and it slipped right out of my hand and down the snow covered river. It was gone, along with 2.5L of water capacity for me. Thankfully Sara&apos;s capacity can cover us both for the next day or so until Shelter Cove, which has a store and presumably a Gatorade bottle or something. Walked a few miles further and ran into some friends we have been seeing on and off all week. Camped with them on a beautiful overlook at mile 1859.3. 7/29/17 – Oregon Skyline Trail, mile 10.4. 7/30/17 – Super dusty all day today. The trail is all dust clouds and skeeters. After about 11 miles we stopped at Shelter Cove Resort, grabbed our resupply and admired another beautiful lake view. Hike up past the Rosary Lakes then a little further. Camped at Bobby Lake, mile 1915.1. 7/31/17 – Started with a climb and mosquito swatting, but rewarded with mostly flat terrain for the rest of the day. So many lakes in this section! Passed by one at least every couple miles. Walked 27 or so miles and camped above Cliff Lake at mile 1941.7. 8/1/17 – Another 27 mile day. Beautiful views throughout the Three Sisters Wilderness. Tons of mosquitos, but not as bad as we&apos;ve dealt with in Michigan or people have made it seem. Found an epic camp spot on a hill, just off the trail before the Obsidian Limited Entry Area. Mile 1969. 8/2/17 – Felt like a long 11 miles to Highway 242, but we made it by mid morning. After waiting just about an hour, a former thru hiker, triple crowner in fact, picked us up in his Tacoma. He knew just what we needed – took us all around town for food and beer, helped us find a place to stay. Started the "Bend Ale Trail" thru hike, already got Crux and Deschutes checked off. Relaxing tonight and figuring out what&apos;s going on with all the wildfires fires in the area tomorrow. 7/19/17 – Finished up with our resupply tasks today, then ventured down to Caldera Brewing. Great food and about 45 beers on tap. They are also home to the largest bottle collection in Oregon. It&apos;s great to be in a "big" (read: college) town for the first time since San Francisco. And usually I am not a city person, but all the time in the woods is clearly having its effect. Enjoyed some beer and then decided to take another day off to check out the downtown Ashland area. 7/20/17 – Felt great sleeping in again! And nice knowing our town chores are complete, for most of Oregon. After a lazy morning in the hotel, we walked downtown and wandered about for a few hours. Explored the hipster shops and hippy watched for a bit. When that got exhausting we bussed back to the hotel, and continued resting our muscles. From here, it&apos;s a several day push to Bend, OR with not much in between but some lodges where our resupply packages are. 7/21/17 – Slept in a little but we were both ready to hit the trail this morning. We had to wait for a taxi unfortunately, but got to the trail before noon. Hiked just about 15 miles in and camped at mile 1729.6 near Pilot Bluff. Brought a couple 10 Barrel brews with us, totally worth the weight and pack out! 7/22/17 – Easy day of hiking, did about 9 miles before our first break then another 7. Water a little more scare now, so we camped by it at mile 1752.8. There does however seem to be an abundance of on trail beer here in Oregon. 7/23/17 – Back into the swing of things for the most part, pulled an easy 20+ mile day. We picked up our package from Fish Lake Resort early afternoon and the lake was just too inviting not to spend the night. Enjoyed the rest of the evening by the lake – we&apos;ve been craving another lake to relax by. Stayed in a rustic cabin a little ways off trail of mile 1770.9. 7/24/17 – Slow start to the day, but worth it to chat with some nice folks we met. Hiked the two miles back up to the PCT then onwards north another twentyish miles. Longer stretches up here without water, must be why they call it the "desert." I always assumed it was more like eastern Oregon. By 6:30 or we found a nice campsite on a saddle, flat spots, views, and even cell service. Set up the tent and cooked dinner just in time for a thunderstorm to roll in. Mile 1791. 7/25/17 – Solid 29 mile day today! Started out with a couple mosquito filled segments but by lunch they had died down. Long dry stretch today, trusted a week old water report update on a seasonal stream which tuned out to be dry. Thankfully we just had another three miles to go to the next one. Heard lots of thunder the last several miles, but the weather held out for us. Camped as soon as we found a flat spot near the water, at mile 1820.2. We are both excited to be just a few miles from Crater Lake itself and to walk the rim tomorrow! 7/26/17 – Woke up to some rain around 2 am, it lasted until about 9 am so we slept in and waited it out. The PCT bypasses Crater Lake itself, so we headed up the rim walk alternate route – it&apos;s actually about five miles shorter! But did involve a nice morning climb up to the rim. Found our way to the cafe and waited out the rest of the clouds sipping on coffee (they offer unlimited refills!). As the sun broke through, we started leisurely hiking the rest of the west side of the rim. It was hard to leave the lake, but we eventually descended a bit and rejoined the PCT, where we camped at mile 1838.3. 7/27/17 – Easy 7 mile walk to Highway 138 today, the north end of Crater Lake NP. We barely had cell service, but got through to Diamond Lake Lodge and the friendly maintenance guy came out to pick us up at the trailhead shortly after. Didn&apos;t make it in time for breakfast so we got our resupply box and mowed down on some hiker food, showered, and dried out the tent. By then the patio bar/grill had opened so we went down to the lake and had a burger and beer. Bought some ice cream, more beer and after chatting with some other folks, retreated to our room to indulge and relax.